destination: Mother, nay Mother Divine ! A mother is the most divine a figure on earth. Adorable as a love incarnate, she has no match in this world. 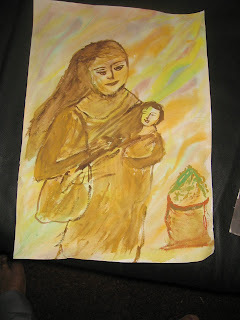 I lost my mother long back and a child in me feels like an abandoned one always, more so on a 'Mother's Day'. It does give me some solace to repeat what I wrote after she was no more several years back. While repeating this piece of a narrative, I just feel like she is very much here all around me. MOTHER, NAY MOTHER DIVINE, IS NO MORE ! SHE BREATHED HER LAST AT 11.25 IN THE NIGHT OF 10TH AUGUST (1991). I WAS THE LUCKY ONE TO BE BY HER SIDE WHEN SHE BREATHED LAST. WITH SERENE CALMNESS BRIGHTLY MANIFEST ON HER FACE, IT JUST MADE A DIVINE LOOK AND THE DARK NIGHT OF AMAVASYA, AS THE DAY HAPPENED TO BE LIKE IT WAS IN THE CASE OF MY FATHER WHEN HE DIED 24 YEARS BACK, DID NOT MAKE THE ATMOSPHERE GLOOMY IN ANY MANNER -IT RATHER HAD A SORT OF A COOL FRAGRANCE. THE LAMP (PETROMAX) WHICH WAS OTHERWISE GIVING A NORMAL LIGHT, HAD ALL OF A SUDDEN A FLICKER, THEN A FLASH AND GONE OFF THEREAFTER COMPLETELY -THE PHENOMENON OCCURRING EXACTLY SIMULTANEOUS TO MY MOTHER BREATHING LAST. THIS I WAS NOT TO BELIEVE EASILY IF I WAS NOT A WITNESS MYSELF TO WHAT HAPPENED LIKE THIS. CERTAINLY MY MOTHER WAS A SOUL PURE AND DIVINE ALL HER LIFE. WHY DO I FEEL SO SHATTERED ON MY MOTHER BEING NO MORE IN EARTHLY EXISTENCE IS THE QUESTION I AM ASKING TO MYSELF GETTING ANSWER FROM THE SPHERE THAT THERE COULD BE PARALLELS FOR SEVERAL THINGS IN THE WORLD BUT NEVER THE ONE FOR MOTHER`S LOVE -MORE SO IN THE CASE OF MY MOTHER WHOSE LOVE KNEW NO BOUNDARIES NOT FOR HER SONS ALONE BUT FOR SEVERAL WHOM SHE TREATED LIKE HER SONS. IT VERY MUCH FEELS AS IF SHE IS STILL AROUND. BUT AS THE TRUTH DAWNS, SHE ISN’T. माँ से बड़ा तो कोई हो ही नही सकता है और माँ की जगह कोई ले भी नही सकता है. My mother is also very great.